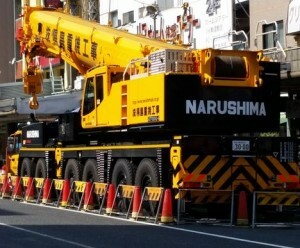 Spotted in Japan, a couple of the new six axle 300 tonne Tadano All Terrain cranes designated the ATF 300G-6 – which would fit into the product line between the current ATF 220G-5 and the ATF400G-6. The new crane of which we have few details at this stage, looks like a lighter version of the 400G-6, with the same chassis and 60 metre main boom, but a different counterweight configuration. The 300 has a maximum of 78 tonnes, while the 400 has 138 tonnes. The difference can be seen on the stability part of the chart, particularly at long radii. The 300 lifts its 300 tonnes maximum capacity at 2.7 metres, but the rest of the structural chart looks the same as for the 400. The range of boom extensions, including the luffing and offset swingaways, with additional insert to 52 metres are available on the ATF300, but not the full luffing jib, at least as far as we know. More details have been requested from Tadano. I simply want to mention I am just newbie to blogs and certainly savored you’re web blog. Probably I’m want to bookmark your site . You definitely come with fabulous posts. Kudos for sharing your website.